As a complex and energetically used joint, the knee is highly prone to suffering painful injuries and developing severe knee conditions. The constant pressure that is put on the knee during the physical activities on a daily basis, wears the knee out and is one of the major causes for multiple knee conditions or injuries at once. Lionel Perales visited Manhattan Orthopedic Care because of an agonizing pain in his knees. 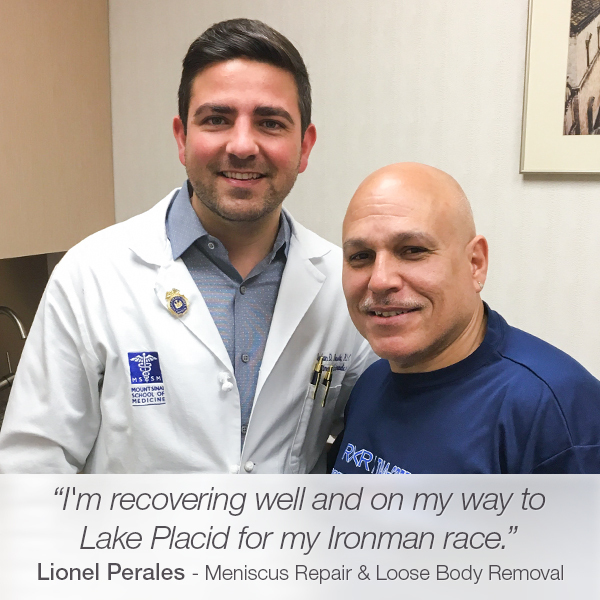 During the initial appointment, Dr. Armin Tehrany thoroughly examined Lionel’s knees and diagnosed him with meniscus tears and chondromalacia of patella. Since both his knees were in a terrible shape, Dr. Tehrany recommended proceeding with a knee surgery that will address all issues at once. Understanding how stressful and terrifying the surgical process can be, Dr. Tehrany calmly explained the surgical details to Lionel, which helped Lionel to understand the overall surgical process, and the recovery period too. At the beginning of the surgery, Dr. Tehrany performed partial medial knee meniscectomy and chondroplasty to repair the meniscus tears and chondromalacia of patella. Unfortunately, during the surgery, Dr. Tehrany also found loose bodies floating in Lionel’s knee, and he proceeded with a loose body removal. Loose body removal is a minimally-invasive knee surgery performed to remove minor floating fragments of detached bone or cartilage. The loose bodies are tissues that have torn away from their original location, and in Lionel’s case, they caused even more severe knee pain while they floated within the knee joint. The knee surgery was a complete success, and Lionel began his recovery shortly after. Surprised and thrilled by the smooth and flawless recovery, Lionel wrote an endearing review on Google.